Below are examples of some of our work and success stories. Please contact us if we can provide any further information on any of these examples, or if we can tailor a custom solution for you. An Association Member query engine delivering prospective leads to its membership based upon services provided, geographical location and licensing in a given state. 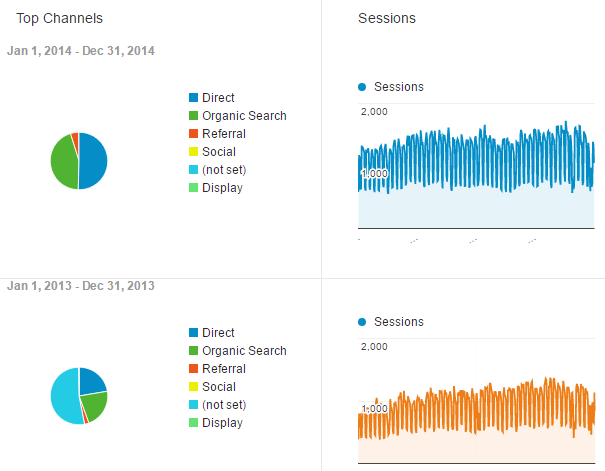 All leads were tracked in a custom Events dashboard in Google Analytics providing reporting to Association management. In 2015 this custom development brought-in over 4,600 leads directly to Association Members. In the first half of 2016 that number has jumped to produce 4600 leads in only six months, potentially doubling the leads from the previous year. Industry specific legislation tracking system (https://watchit4u.org/) reporting information, from Federal and State Legislation to relative happenings within the CFPB, FTC, IRS and others as well. All information updated daily and stored in our extensive, easily searchable database. In 2013 our team was asked to build a new site for the hospital from the ground up. This required the skills of our entire team: digital strategy, copy writing, web design, and obviously web development. This was a significant project that spanned several months. In the end, the project was completed on time and on budget. It was a huge success and continues to improve and grow. Below are some statistics of site use from the year prior to the new site launch (2013), through the following year (2014). As you can see traffic acquisition via organic search and via referral doubled – a testament to the creation of the site structure and copy writing with SEO being a top consideration. 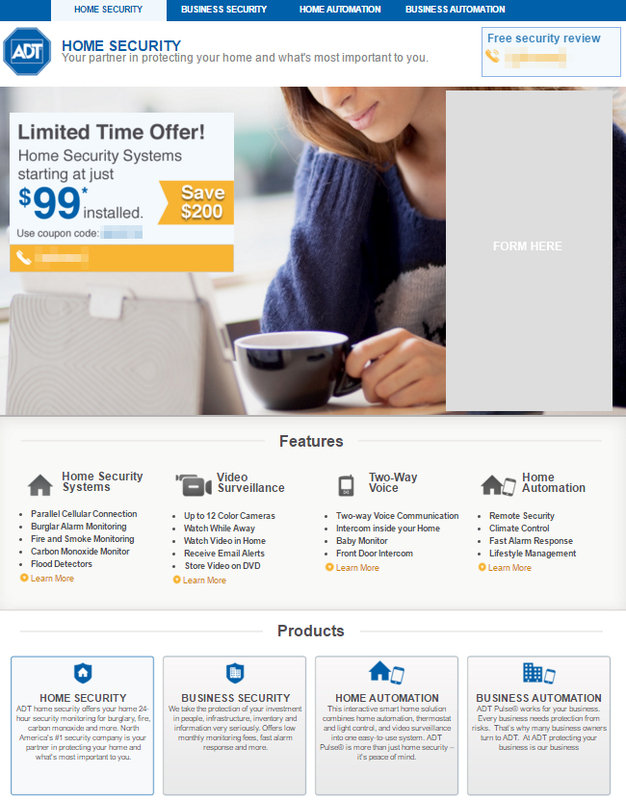 Support for SEM campaigns facilitated by custom landing page templates. 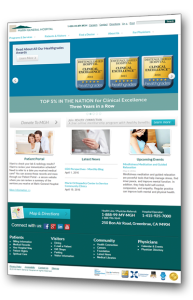 Starting in 2013 we established SEM campaigns for a variety of service lines at El Camino Hospital: Orthopedics, Men’s Health, Bariatrics and Bronchial Thermoplasty. 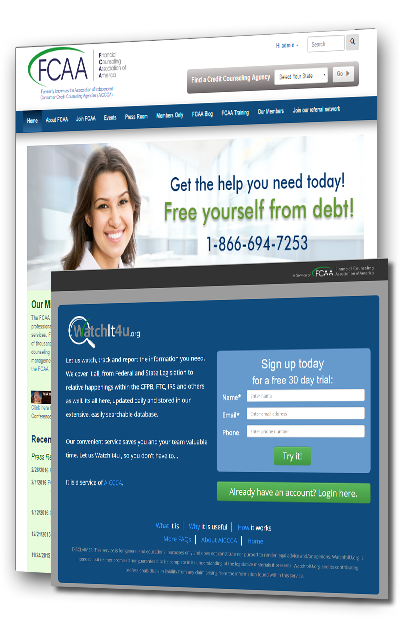 For each campaign custom landing pages like the one to the right were created, A/B split tested, and optimized to produce the best converting interface at the lowest cost per conversion. 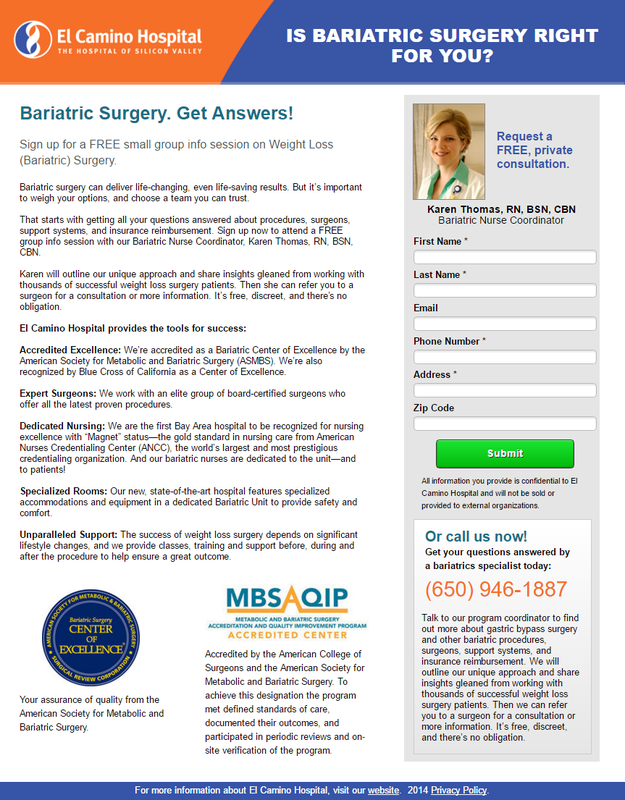 While all service lines saw impressive results, the Bariatrics campaign was most successful. With a goal of further qualifying patients before they called or completed a form, we developed a custom Body Mass Index (BMI) calculator to sit within this landing page. 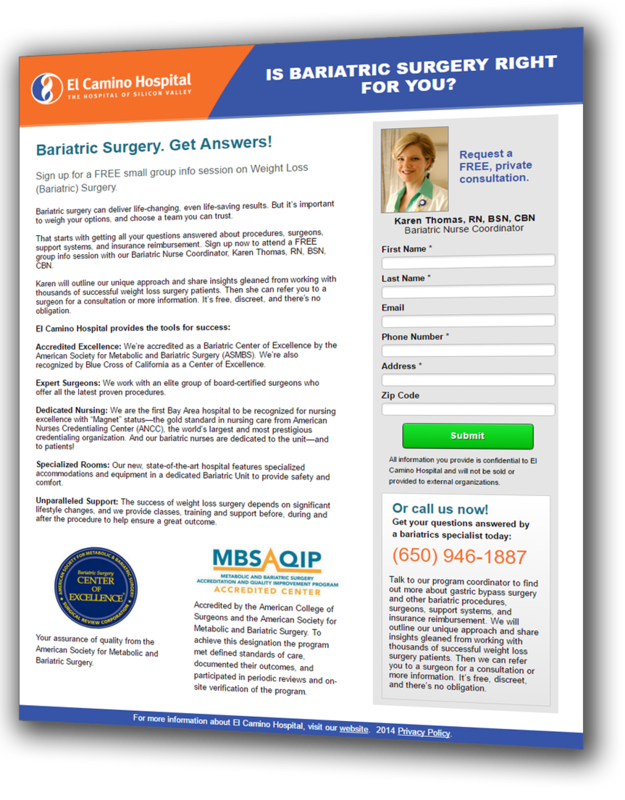 Visitors could use the calculator to help determine if physically matched the requirements for bariatric surgery. By the conclusion of the campaign over 580 leads via form completions, and tracked phone calls were recorded. Based on the average cost of a bariatric surgery of $14,500-$23,000 these leads could generate $8.5-13.5 million in hospital revenue. Our experience spans beyond SEO and SEM, we have extensive experience with relationship marketing, including email template creation and use of marketing automation tools. 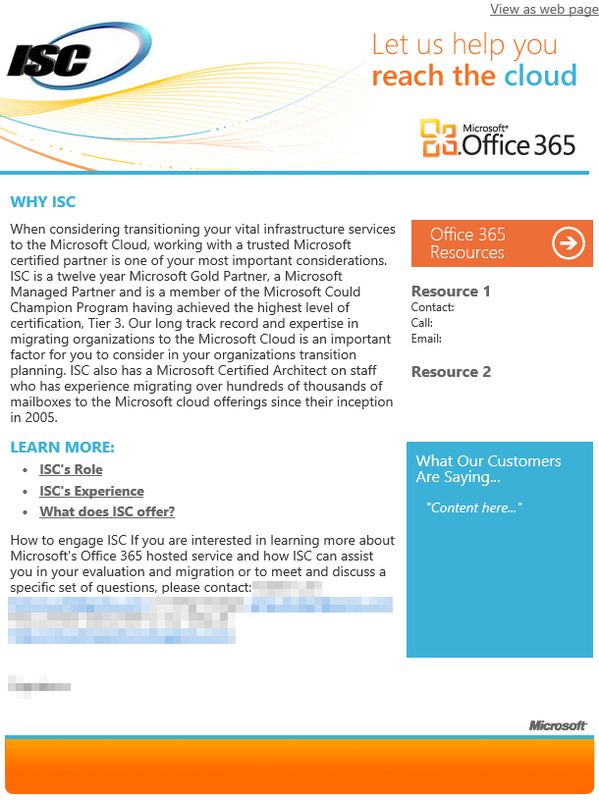 Below are a couple of examples of email templates built for different clients. 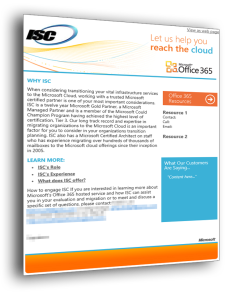 The Microsoft template was built in .oft format and optimized for distribution to Microsoft Outlook clients. 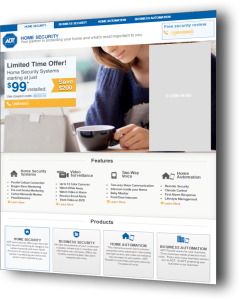 The ADT email was built in HTML 5 with Cascading Style Sheet (CSS) optimized for web mail. No matter what your audience, Ardent has the experience and skill to deliver the right email solution for your needs.